To be added to the A3M e-mail list for additional announcements and discussion, send an e-mail request to . Please contact us if you have photos, anecdotes, or other material to share. On May 7, 1989, some 50 or 60 veterans of the Stanford anti-war movement wound their way into the basement of the Applied Electronics Laboratory building, site of their nine-day sit-in against secret military research a little more than twenty years ago. The AEL print shop, from which protesters produced nearly a million sheets of political literature, was gone, replaced by simple offices in the new age of laser printers and high speed copiers. We gathered again outside the building to hear Paul Rupert tell how a fictional call to his mother in April, 1969 quelled university president Kenneth Pitzer's from-the-floor-microphone attempt to sidetrack the sit-in. When Lenny Siegel's seven-year old daughter and two-and-a-half year old son kept insisting on going back into AEL, Paul commented, "It's in their genes." 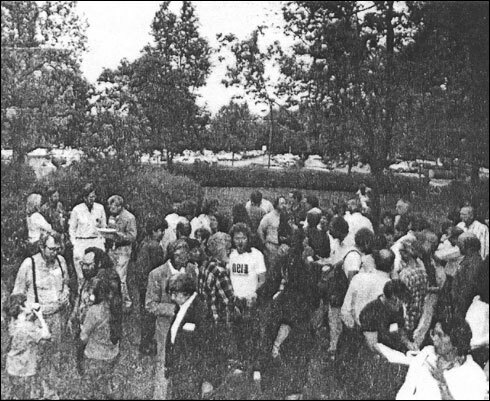 The campus tour was just one of several successful events of the A3M Reunion, actually a gathering of Stanford anti-war activists from the early days of napalm demonstrations to the candlelight march protesting the Christmas, 1973 bombing of Hanoi. As many as 300 peace movement veterans—former students, faculty, and staff—joined current students to reflect on both the personal and political causes and impact of the Stanford movement against the Vietnam War. Friday night, about 35 participants attended a reception at the Pacific Studies Center, in Mountain View, about seven miles from the campus. PSC, an offshoot of the April Third Movement, still monitors the impact of Stanford and its environs—globally known as Silicon Valley—on the world. Sponsor of the reunion, PSC retains the archives of the April Third Movement as well as other documents from that era. Lunchtime, like all other unstructured periods, provided participants with the opportunity to meet informally, view a display of old Stanford posters, and pick up reunion buttons and directories. The latter has been expanded to include information from those who submitted information at or following the reunion. Over the course of the afternoon, Tresidder Union's Oak Lounge filled with 250 or more participants. At the first afternoon panel, Clay Carson, David Harris, David Ransom, and Marjorie Cohn traced the development of the Stanford peace movement from the birth of SNCC in the south to the demonstrations of spring, 1969. David Ransom's talk, excerpted later in this booklet, described the multi-year strategy, tactics, and techniques that culminated in the AEL sit-in and the blockade of SRI's counterinsurgency labs in the Stanford Industrial Park. The second panel assessed the impact of the student anti-war movement. Lenny Siegel suggested that the movement spurred the development of the microcomputer, triggering a new direction for a major portion of advanced technology. Dolores Donovan pointed out the links between the peace movement and the nascent women's movement. Jim Shoch argued that the movement, among other factors, hastened the end of the Vietnam War, while Robert McAfee Brown said without our movement, U.S. troops would be in Nicaragua today. Paul Rupert, chair of the second panel, addressed the student proposal for a progressive alumni club. He took the only vote of the event—a resounding endorsement of the proposal. Once established, the group will serve as a network linking alumni from the various periods of progressive activism on the Stanford campus; It will attempt to influence university policy, perhaps by running candidates for the Board of Trustees. And it may raise money in support of progressive political and educational activities on campus. Some participants were skeptical that movement alumni, many of whom have limited resources, could generate the financial clout necessary to make such a group effective, but others, including a successful high-tech entrepreneur and a senior vice-president at the Bank of America, suggested otherwise. The buffet dinner at the Bechtel International Center attracted a much larger crowd than anticipated, but no one seemed to complain when the food ran out. There were, at least, enough éclairs (a la trustees) for dessert. Marc Weiss led a hastily assembled cast through a reenactment of “Alice in ROTCLand,” from 1970, In the absence of Sigourney Weaver, the original Alice, Mary Hanson carried away the “A3-Emmy” certificate for Best Actress. We honored Charles Stein for never missing a demonstration, Jim Wolpman for his legal defense of so many of us, and the absent Fred Royce for his work in Nicaragua, training diesel mechanics. We remembered Abbie Hoffman as well as many of our own who are no longer with us, including Nan Goldie, Julia Harvey, and Bob Griffin. As the sky darkened, we moved inside to view films of the SRI demonstration and the 1969 PBS documentary on Stanford SDS. It was amazing to see that so many of the people who had made A3M successful were in the room. The PBS film, Fathers and Sons, has many weaknesses, but it illustrates, in a way that few documentaries have, the movement's bumpy development of organization, tactics, and strategy. Sunday morning, over forty alumni and members of today's campus religious community at Stanford gathered in the Round Room of Memorial Church to honor former Chapel Dean, B. Davie Napier. Current Dean, Robert Gregg, and Robert McAfee Brown, who served as Dean briefly after Napier, introduced Davie. The campus tour, mentioned above, retold campus meetings and confrontations from the Spring, 1966 anti-draft sit-in in Wallace Sterling's office to the occupation of the computer center in 1971. Participants revealed previously untold stories about how they managed to enter locked buildings. Interestingly, several movement alums forewent battle stories to emphasize the importance of research, publications, and organizing as a stimulus for direct action on the Stanford campus. Most of those who attended the final event, the family picnic in Escondido Village, revealed that the reunion had succeeded well beyond the brightest hopes of its organizers. Rather than a big chill, participants displayed a deep sense of warmth. A few participants still harbor old resentments, but others spent time apologizing to old adversaries (among the movement) for sins long forgotten. On Saturday, some in attendance professed concern, even guilt, that they were not doing more politically, but given the demands of career and family, a surprisingly large number of A3M veterans remain committed to the goals and perspectives they forged twenty years ago. For many, the, reunion added momentum to their current work; for others, it tied together loose ends left over from the factional years of the 1970s. Many A3M'ers shared the work and responsibility to make the reunion a success, from organizing child care to assembling the initial director of participants. Those who came did not hesitate to help out, whether that meant moving the bulk poster display or cleaning tables after dinner. Of course, in 1969 we mopped the floors while we sat in at AEL. Despite the divisions that emerged as the prospects for "revolution" dimmed, the cooperative spirit we forged twenty years ago still lives. In Fathers and Sons, in 1969, one undergraduate woman asked, "How do we build community?" If nothing else, our movement answered that question. In language that seems anachronistic in tone but pertinent in concept, one builds community by struggling together. The following is excerpted from David Ransom's presentation to the A3M Reunion on Saturday, May 6, 1989. Like other members of the first afternoon panel, he was asked to help answer the question, "Why Did [the Stanford AntiWar Movement] Happen?" It was the character of Stanford itself that made the Stanford movement what it was. Here was a university built by one of the pre-eminent robber barons of the post-Civil War period, directed by a board that was a "Who's Who" of West Coast capital, which had thrown its political weight around heavily, after World War II, in molding local and regional development to its benefit, and whose economic interests in Asia and Latin America couldn't have been clearer. Add to that the triad that encompassed Stanford —the engineering school, SRI, and military manufacturing in the Stanford Industrial Park—and it took no genius to expose Stanford's involvement in the war. Add to that the change in national draft policy so that students no longer got automatic deferments, and the policy being pursued by the Stanford trustees was no more in the self-interest of the students than it was of the Vietnamese. It took no genius to expose this and to make effective politics out of it. Of course, we had genius. Most movements do. But genius couldn't create conditions. The kids at Foothill or San Jose State did not have our board of trustees, so their movement had to be different. And it was. What "genius" could do was to recognize a basic strategy and hold to it—and to develop tactics. And, quite frankly, once we had set on that strategy, our tactics are what made the difference. that the trustees—politically and economically, and masquerading as educators—were, therefore the necessary and appropriate target, and who controlled the university was the necessary and appropriate question and tantamount to asking, "Which side are you on?" believe, I remember coming out of Memorial Auditorium and seeing five guys holding up signs urging us to support the Vietnamese revolutionaries. That was a gutsy thing to do, then, especially as four of the five were foreign students. Ant those young men-all graduate students, I believe had an impact on the Stanford movement that lasted long after they left. They not only posed the question, Which side are you on?, they also inserted the idea of imperialism into the movement, and they introducer Marxist theory as the way of best understanding, what we were up against. There were those who were uncomfortable about that and who argued that all of it unnecessarily divided the movement. But, in fact, it is what united it and kept it honest. Without that outlook in the movement, there would have been nothing to hold it steady against the Stanford administration's tactic of co-option. And, besides, the road to justice on which we were embarked led directly to confronting the concepts of class struggle and socialism. Why reinvent the wheel? I'm not going to go into great detail on the history of the development of the tactics of the Stanford anti-war movement, though that's where the glory lies and that's where the fun is in reminiscence. But there are other some points that need to be made. That the organized form of our movement that still exists is the Pacific Studies Center is not accidental, I suspect. It points up the central importance that research, analysis, and education played throughout the whole period. At Stanford and elsewhere, if my memory serves me, that began as loosely coordinated muckraking into the university's part in the development and production of chemical and biological warfare. It went on from there. The Experiment, an on-campus cousin of the Free University, produced the first comprehensive studies of the trustees and the war and published them in Resistance, an on-campus predecessor of the first of the Peninsula's alternative newspapers, the Observer. It was that campaign that resulted in the "We Accuse" posters we've got in the display. And I remember that David Packard's daughter came back from her junior year abroad, having turned against the war in Italy, only to find her father's photo on wanted posters all over campus. But, of course, our movement reached a high point with AEL, and that's where a lot of the fun lies-and the sense of where years of preparation had brought us. First, SDS was able to ambush the trustees in an open debate that won a whole generation of campus skeptics to the movement. Who can forget that, when Hewlett was asked if FMC manufactured nerve gas he first said no and demeaned our research, only to have to admit to a voice from the crowd that the company had sold its nerve-gas facility to the government only six months before. Who can forget that, at the end of that debate, when the trustees complained that the SDS debaters and their demands were unrepresentative of the campus, the crowd—which had come in undecided—shouted in unison that the demands were theirs. Then, of course, the Observer published the debate verbatim, printed ten thousand copies, and distributed it on campus. "Trustees Drop Bomb" was the front-page headline.